Local 25 Boston Teamsters renewed their support for ARI’s research and education initiatives earlier this month with a $25,000 gift. ARI Executive Director, Stephen Edelson, Ph.D. expressed his deep gratitude for the support. “These precious funds help researchers investigate promising areas of research help us educate parents and providers about new findings about treatments and educational strategies,” Dr. Edelson said. The Teamsters Local 25 Autism Fund has donated more than $4 million to a variety of deserving charities and research institutions since its inception. ARI is grateful to be included. In addition to the Malden Challenger League, Local 25 recognized 11 other nonprofits for their work with people with autism: Autism Speaks, Boston Higashi School, Braintree American Challenger League, Jason Roberts Challenger League, The Mark Fidrych Foundation, McLean Hospital Autism Program, Medford Invitational Tournament, Norfolk County Sheriff’s Youth Leadership Academy, Special Townies Organization, Stoneham Light It Up Blue, and Technology for Autism Now. 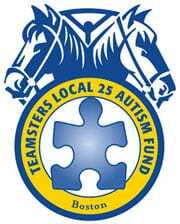 Now in its 11th year, the Teamsters Local 25 Autism Fund has donated more than $4 million since its inception. Its major fundraiser is the annual Teamsters Local 25 Light up the Night Gala, which takes place each April.. The Gala serves as a major autism awareness vehicle as well as a critical fundraiser for programs that help children, teens and adults with autism or developmental delays.